I do a lot of work for charity that I obviously don't like to talk about. Don't we all? I'm not saying I'm a saint, but I support lots of charities for lots of reasons. I'm sure most people do the same. It might be a charity whose work I strongly believe in - Oxfam or Shelter or Amnesty International. It might be a charity that I have a strong personal interest in - the MS Society. It might be the chosen charity at work: Macmillan. It could just be a charity that I'm supporting because I want to support a friend as they raise money for something close to their hearts. There are lots of reasons for supporting a charity. A few years ago, my mum and dad sponsored a toilet in Cambodia on our behalf. It was a really cool gift where you get a framed picture of the toilet in question that you can hang up in your own bathroom, officially "twinning" your loos, and the charity gets the money to provide clean toilet facilities somewhere in the third world. You even get the GPS coordinates, so if you really want to, you can visit your bog (and trust me, in Cambodia, you might be glad of it). 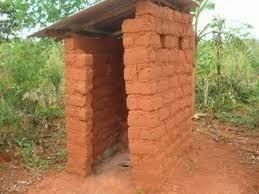 I liked the gift so much that I used the charity when I was looking for a wedding present for one of my best friends, He met his wife whilst travelling in Africa, and a toilet block at a school in Burundi seemed like an excellent idea. The charity is called Tearfund. I was aware that they had a Christian background (and that's probably how my dad found out about them), but it was a great idea and I do not have so great an ideological objection to religion that I can't see past that to the good work they might be doing. Helping people is helping people, right? "Hello! Since I last checked in, we've come up with a brand new strapline which we feel tells the right story about our work here at Tearfund: 'Following Jesus where the need is greatest.'" I have absolutely no objection to them being religious - the work is clearly the most important thing - but they don't seem to realise that putting the big JC front and centre of their work might be alienating to some people. Surely not everyone who supports them is Christian, and presumably not everyone they work with in the third world is Christian either. I'm sure they mean well, but is it not enough to be doing a good thing for another human being without bringing religion into it? Are you motivated by the desire to help or by the desire to please your God? Does it matter? I sort of think that it does. I'm sure they'll continue to do great work, probably with shiny-eyed zeal and a lot of clapping and singing, but I'm going to take my charity dollar to somewhere less political, or at least to somewhere the politics are more aligned to my own. Sorry about that, Tearfund. All the best with your work, but I'm out.